WILLEMSTAD - Independent MP, Omayra Leeflang had questions to Prime Minister Ivar Asjes on a luxury edition of a magazine for the Curaçao House. A glossy magazine, as the Member of Parliament calls this publication. Leeflang wants to know what it will cost and whether the Minister Plenipotentiary Marvelyne Wiels has been given approval by the Council of Ministers to publish such an expensive magazine. In her letter to the Prime Minister the MP also mentions the fact that the cover of the magazine recently ended up in the media in the Netherlands because the person featured on the cover was not aware of the use of her photo. Singer Kris Berry did not give permission for the publication of her photograph on the cover of the Curacao House magazine. 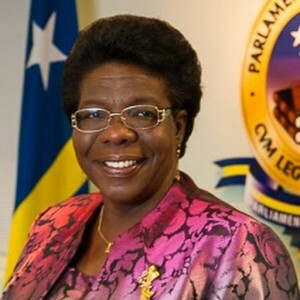 The Minister Plenipotentiary offered her apologies to the singer.